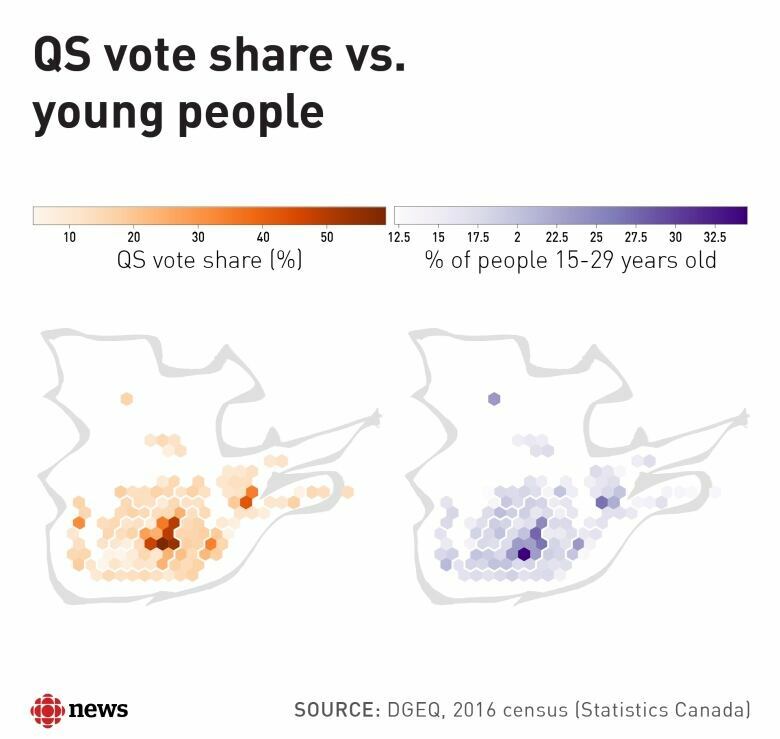 Did demographics determine the results of the 2018 Quebec election? These maps provide a clue. A lot of us are still scratching our heads at Monday night's election results. The Coalition Avenir Québec ended up with a much larger majority than anyone was expecting. Support for both the Liberals and the Parti Québécois dropped well below their historic baselines, while small left-wing Québec Solidaire broke out of its Montreal enclave. In order to get a better sense of why this happened we dove into the data and produced a few maps that help tell the story of the election. These maps may look a little funky, but they've been designed so that each ridings appears as a hexagon of equal size. This should make it easier to pick out geographic and socio-economic patterns. Read more about why we chose to show ridings this way. One of the biggest factors that explains the CAQ victory was the party's appeal among French-speaking Quebecers. This map shows a high concentration of CAQ voters in ridings that have high concentrations of francophones, particularly in central Quebec and south of Quebec City. They performed better in these ridings than in 2014. 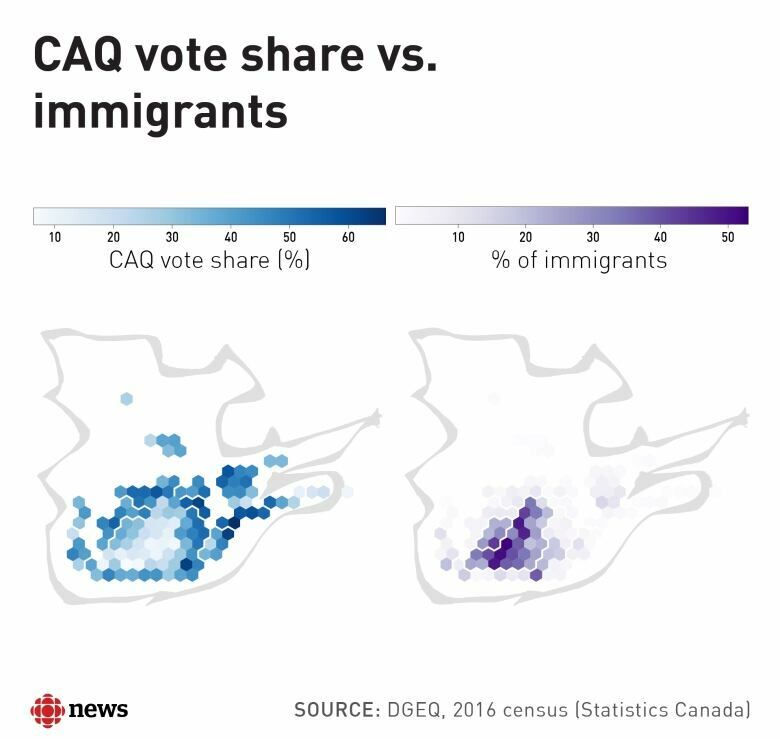 On the other hand, the CAQ did poorly in ridings with high numbers of recent immigrants. This, perhaps, is not surprising given its controversial campaign promise to cut immigration levels by 20 per cent. The party performed worse in these riding than in 2014. Given that the CAQ is a centre-right party, it is perhaps surprising to see how well it did in ridings that had high numbers of people working in the trades (welders, electricians, etc.). Many of these ridings, though, are located in Quebec's industrial belt, east of Montreal. The recent rise of an entrepreneurial culture in these ridings has coincided with increased support for the CAQ, a phenomenon we explored in more detail here. 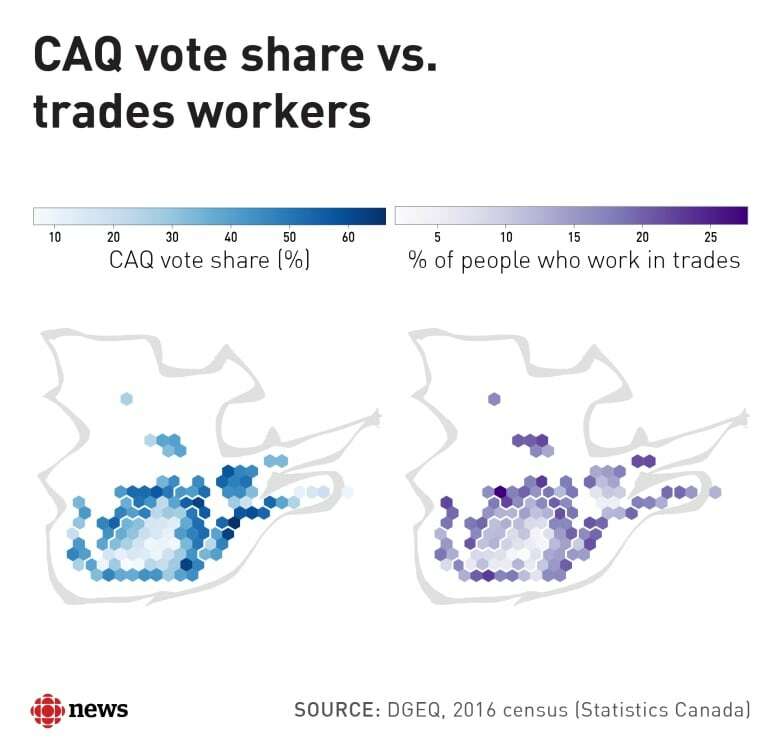 There was only a weak correlation in 2014 between CAQ vote-share and presence of trade workers in a riding. That correlation became much more pronounced in 2018. 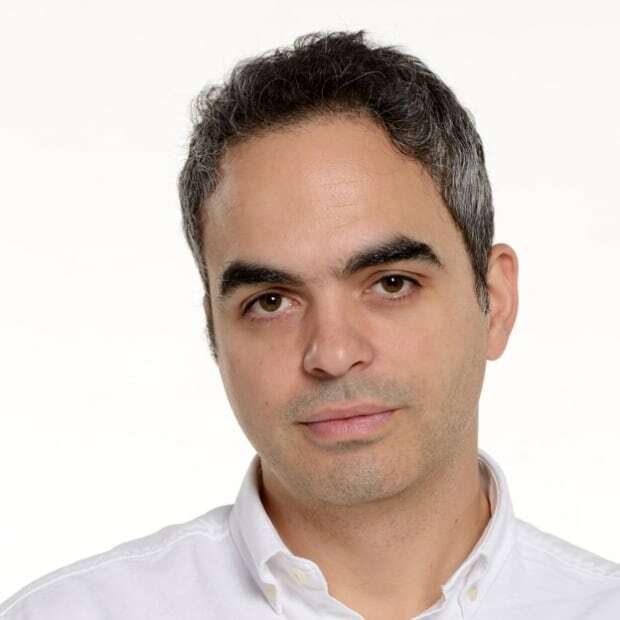 The left-leaning party surprised many people by winning four seats outside of Montreal and in areas not commonly associated with progressive politics. One big factor that explains this breakout performance is the party's support among young people. QS won two seats in Quebec City and one in western Quebec. These urban centres have a larger proportion of people aged 15 to 29, as this map shows. QS also demonstrated that its promises — which include free education, more public transit and universal dental care — resonate in ridings where many people are struggling to make ends meet. 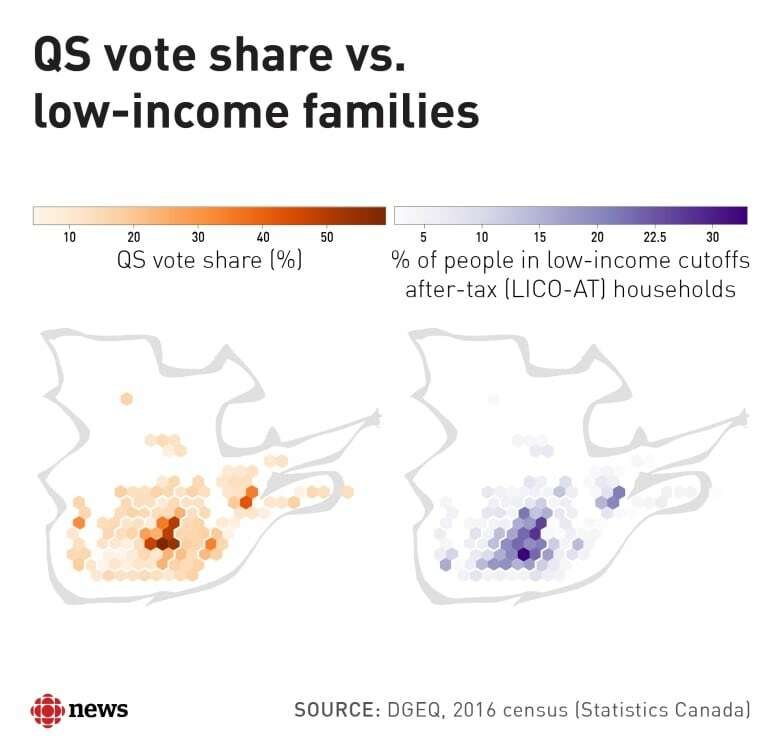 This map demonstrates there is a correlation between the number of low-income households (as measured by the low-income cut-off measure) and QS vote-share. In other words, more low-income homes, more votes for QS. 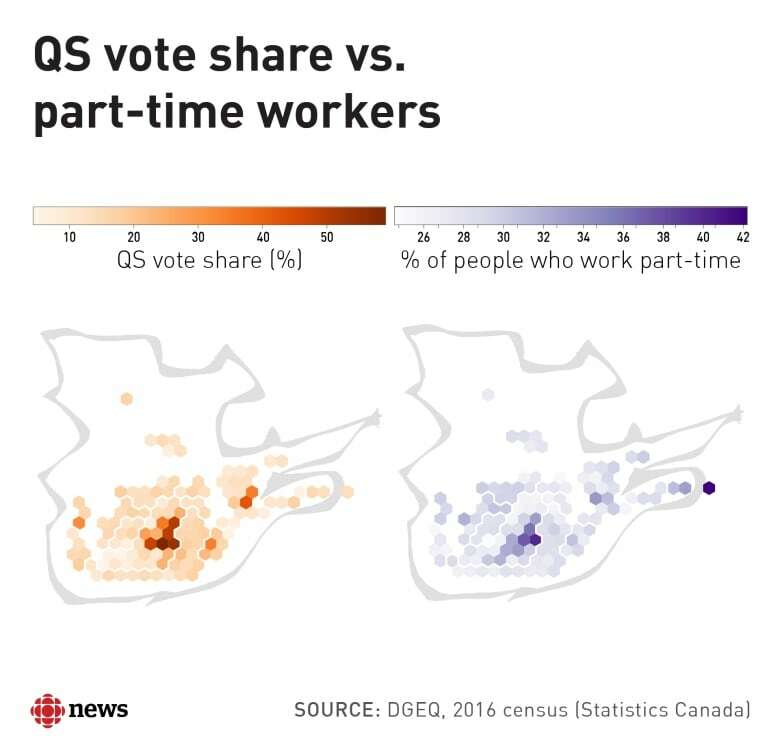 The party did well, too, in ridings with higher numbers of part-time workers. There could be some overlap here, as part-time workers tend to be young and less wealthy. The Liberal Party has long been the go-to choice for Quebec's anglophones, and that didn't change on Monday. But voter turnout in anglophone-heavy ridings dropped significantly, which hurt the party's popular vote score. Liberals have also, traditionally, been able to count on the support of immigrants. Our data suggests that trend held true in this election. 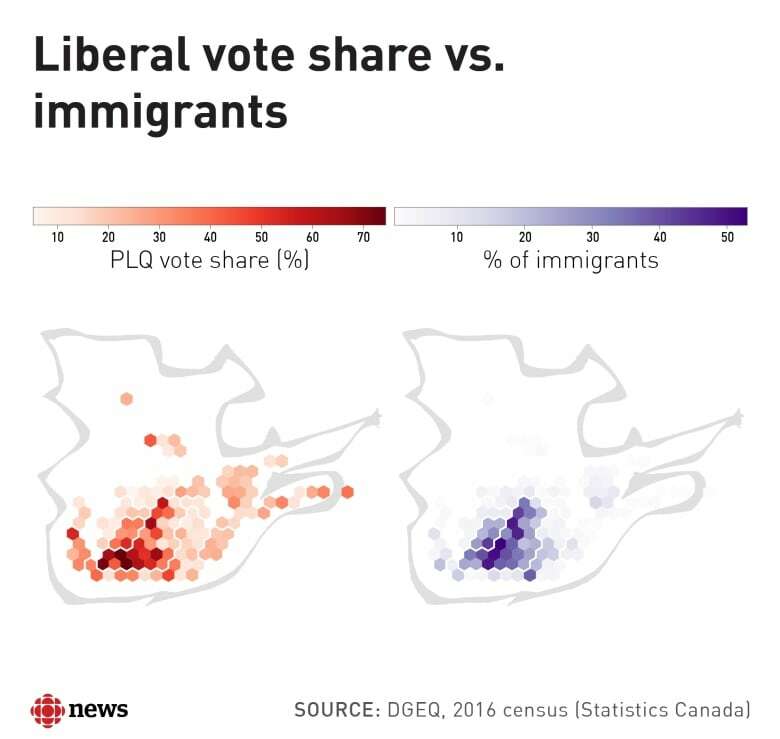 In fact, the Liberals improved their performance in ridings with large immigrant populations, compared to 2014. 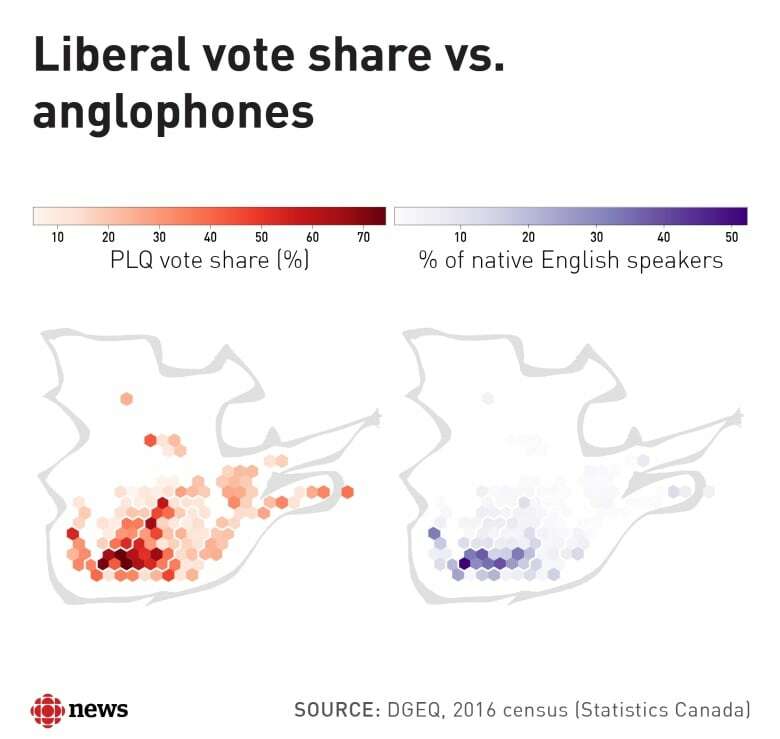 But their support worsened in largely francophone ridings, which represent a far greater number of seats in the National Assembly. To make these maps, the CBC compared election results in 2014 and 2018 to socio-demographic data from Quebec's chief returning officer (DGEQ), which is based on the 2016 census. We calculated the Pearson correlation between each party's vote share and about 50 selected census variables across all ridings. The maps above show the variables with the highest correlations. Note that no variable had a perfect positive or negative correlation with vote results. 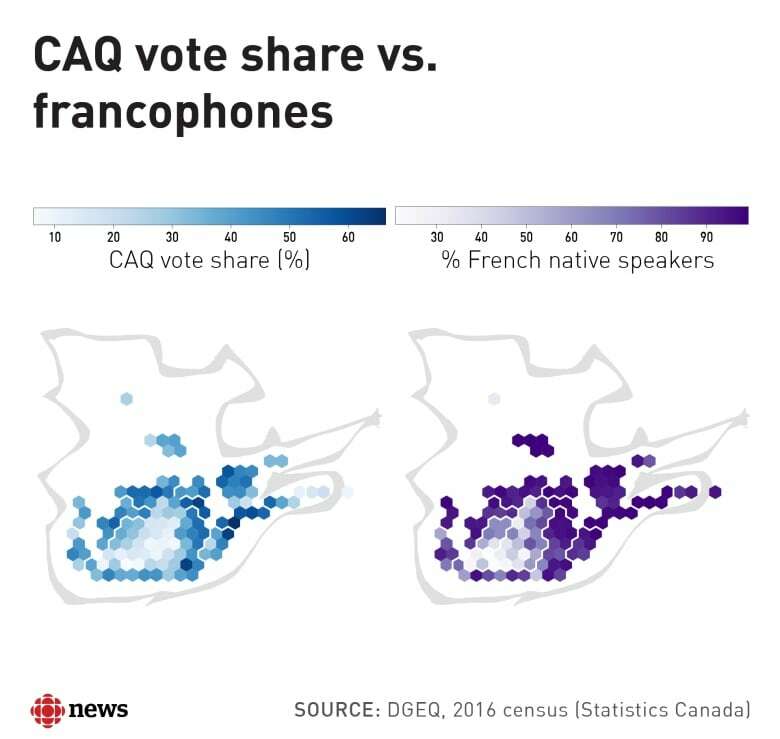 For example, the strongest correlation coefficient, of -0.87, was found between Liberal vote share and proportion of francophones. Graphics by Darcy Hunter, with files from Marc Lajoie of Radio-Canada.